Murray, whose previous career high was 38 points, led the Nuggets to their fifth consecutive win and their ninth in 10 games to open the season. 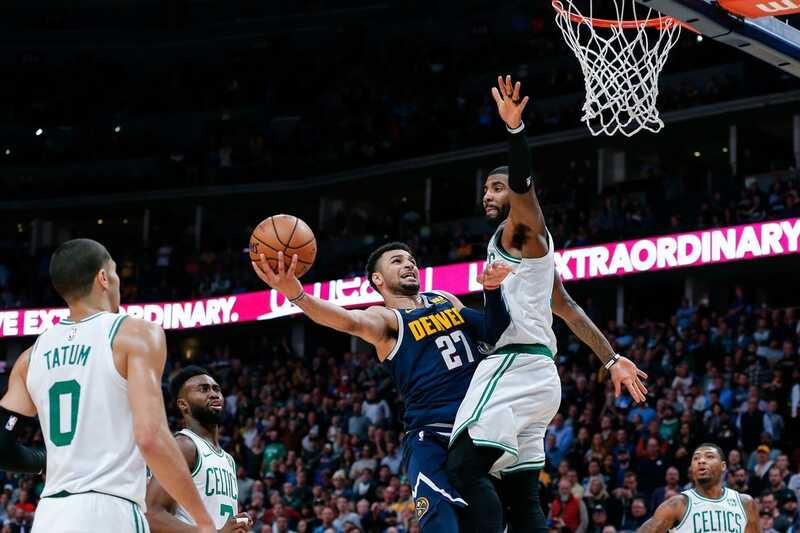 Irving finished with 31 and Jayson Tatum and Jaylen Brown had 15 each for the Celtics, who have lost two straight. Stephen Curry and Alfonzo McKinnie connected on 3-pointers in a 14-point Golden State run late in the third quarter that propelled the two-time defending champions to a victory over Memphis in Oakland, Calif.
Klay Thompson scored a game-high 27 points for the Warriors, who won their eighth consecutive contest overall and sixth in a row at home despite losing Draymond Green in the second quarter to a foot injury. Kevin Durant had 22 points, and Curry finished with 19. Marc Gasol flirted with a triple-double for Memphis with eight points and game highs in rebounds (10) and assists (nine). Dillon Brooks had a team-high 18 points, while Jaren Jackson Jr. and Shelvin Mack scored 15 apiece for the Grizzlies. Josh Richardson had 27 points, eight rebounds and four assists, and visiting Miami snapped a three-game losing streak with an overtime win against slumping Detroit. Goran Dragic contributed 21 points, seven rebounds and six assists for the Heat, while Dwyane Wade added 18 points. Andre Drummond powered for 25 points and 24 rebounds for Detroit, which lost its fifth straight. Wade moved into 30th place on the league's all-time scoring list during the first half, surpassing Clyde Drexler (22,195 points). Wade ended the night at 22,211. With star point guard Russell Westbrook out in the second half due to an ankle injury, Dennis Schroder scored nine consecutive Oklahoma City points in the fourth quarter in a win over visiting New Orleans. Schroder finished with a season-high 22 points off the bench -- 16 in the second half -- as the Thunder extended their winning streak to five after losing the season's first four games. It was New Orleans' sixth consecutive loss after a 4-0 start. Schroder got his chance for a big finish after Westbrook twisted his left ankle with 4:25 remaining in the third quarter. Westbrook rolled over and grabbed his left leg before slapping the floor in pain and frustration. Soon afterward, he went to the locker room, not putting any weight on the leg. Zach LaVine's career-high 41st point, a free throw with 0.2 seconds left in the second overtime, snapped a tie and lifted visiting Chicago over New York. The Bulls snapped a four-game losing streak. The Knicks lost for the third time in four games. Antonio Blakeney had 17 points and Jabari Parker added 15 points for the Bulls, who received a double-double from Wendell Carter Jr. (11 points, 13 rebounds). Knicks reserve Enes Kanter had 23 points, 24 rebounds and seven assists -- the first sub to produce a game of at least 20-20-5 since Charles Barkley on Nov. 28, 1986. Kyle Lowry scored 17 points, dished out 11 assists and collected seven rebounds to lead Toronto past Utah in Salt Lake City. Three other Raptors players also scored 17 points -- led by Serge Ibaka, who came off the bench to make all eight of his shot attempts before fouling out early in the fourth quarter. Alec Burks led Utah with 22 points off the bench in his first game back after missing four games with a left hand chip fracture. Utah played without Donovan Mitchell (sprained ankle) for the second time in three games. Toronto played without Kawhi Leonard (jammed foot) for the second consecutive game. James Harden scored 28 points, but his lone block helped Houston secure its third consecutive win, beating Indiana at Indianapolis. Pacers guard Victor Oladipo scored eight points down the stretch, but Harden blocked an Oladipo shot with 28.8 seconds left and the Rockets leading 93-90. Harden later sealed the victory with two free throws with 5.4 seconds remaining. Harden and P.J. Tucker (nine points, five rebounds, two steals) each hit a late 3-pointer to offset the surge by Oladipo, who led Indiana with 28 points. Domantas Sabonis added 17 off the bench for the Pacers. Evan Fournier nailed a tiebreaking jump shot at the buzzer to give host Orlando an improbable home win after Cleveland turned the ball over twice in the final 20 seconds. The Cavaliers had a three-point lead with 18.7 seconds left, possession of the ball and the shot clock turned off, but Cedi Osman's bad pass was intercepted by D.J. Augustin, who was fouled and made both free throws. Two seconds later, Kyle Korver turned the ball over, and Fournier made one of two free throws to tie the score after he was fouled at the basket with 13 seconds to go. Nikola Vucevic blocked a shot by Cleveland's George Hill with 2.2 seconds left, setting up Fournier's winner. Tobias Harris and Danilo Gallinari scored 22 points each and Lou Williams added 20 off the bench as Los Angeles held off a late run from visiting Minnesota. Derrick Rose scored 21 points for Minnesota in his second start of the season. In his first start last week against the Utah Jazz, the former MVP had a career-high 50 points. Karl-Anthony Towns scored 20 points for the Timberwolves, but just seven after the first quarter. However, he grabbed a game-high 12 rebounds. Minnesota's Jimmy Butler also had 20 points, 16 of which came in the fourth quarter.